The Project Gallery is like a visual Table of Contents of all the fun stuff that happens here are at Rambling Renovators. I've gone through the archives and organized things into a few categories: Renovations & Architectural Plans, Home Improvement projects, Holidays & Celebrations, Crafts, Decorating ideas, and Kid Projects. That's 5+ years of DIYing. Check it out! 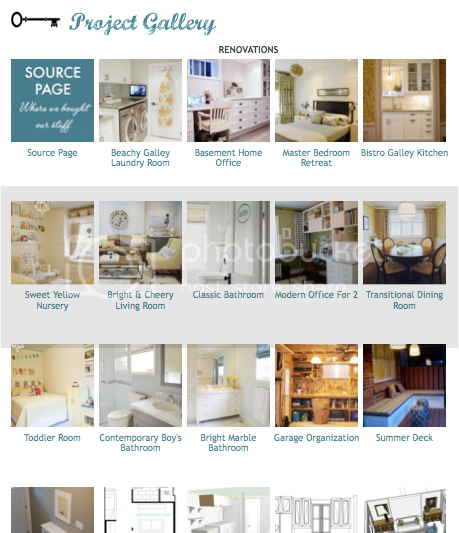 TIP: Want to build your own Project Gallery for your blog? I used the Link Manager by InLinkz. Here's a video about this awesome tool. Very cool. And thanks for the plugin tip! You're quick! They had the cheapest price we found and measure and install was super quick and easy too. We got our first quotes for this project two years ago (too high)... I recently tried calling the guys who installed the glass shelves in our kitchen, but they never phoned back!!! I hope it will be a quick and easy job!!! I called - decent price! I am getting them to come by at 4 today to measure. I am calling your mirror guy this morning! As soon as the little one nods off!!! THANKSSS!!!! !